In recent years Sony has released many hot HD TVs, and there are a lot of users choose to buy Sony TV to replace their old TVs, watching TV shows and movies on bigger screen will give us better enjoyment. Got some DVD Video_TS folder files and want to play these Video_TS folder files on your Sony TV through USB port? If so, you may have to do something in advance. I mean you’ll need to convert Video_TS to Sony TV supported file format first because Video_TS is not supported by Sony TV. If you’ve no idea about this, here is a simple tutorial for you. Keep on reading for details. As you know, a Video_TS file actually is a DVD folder file, mainly containing all data for the DVD movies, which is not supported by bulk of smart TVs including Sony TV, Panasonic TV, LG Smart TV, etc. To solve Sony TV Video_TS playback issues, the best bet is to convert Video_TS to Sony TV more compatible video format like MP4. Afterwards, you are able to put the new file on the USB or serviio server and transfer to Sony Televisions for playback without any hassles. 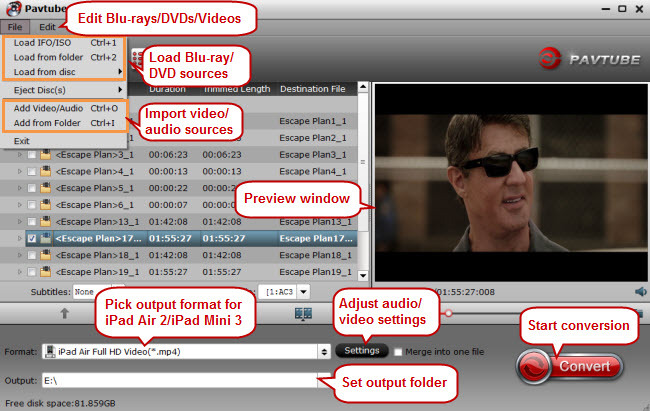 Now get the Video_TS converter and follow the tips to finish your Video_TS to Sony TV conversion. Start Video_ts to Sony TV converter and drag Video_ts files or click “Load file(s) > Load from folder” to load the Video_TS folder to the program. There are many titles in one Video_TS folder, usually the main title is selected by default. 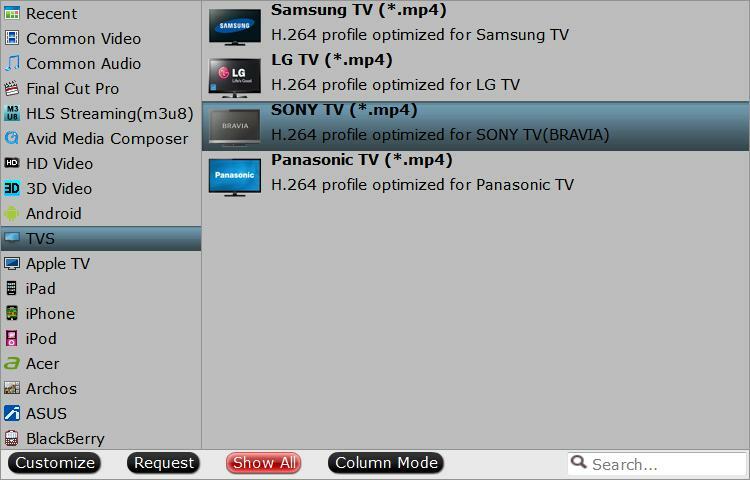 Set output video format as “Sony TV (*.mp4)” under Format > TVS. Tip: To adjust video and audio parameters like codec, aspect ratio, bit rate, frame rate, sample rate, you could click on “Settings” button. The higher video bitrate, the better video quality, but the larger output file size. Hit “Start converson” button; this video converter will start the Video_TS conversion for Sony TV through USB/serviio server in no time. After the conversion is over, connect the USB drive with computer and head to the destination folder where the converted files are stored, transfer the files to the USB drive or serviio server in the Sony TV for video playback with your families and friends. Next → Next post: Can Sony TV read .mov from external multimedia HDD?